ACTIS Hybrid system is a range of products which combine insulation, acoustic performance, vapour permeability, air tightness, moisture resistance and reflective properties, all LABC, LABSS accepted and CE Marked. Hybris is an innovative insulation material providing excellent thermal performance for timber frame or masonry walls, pitched roofs and ceiling applications. ACTIS thin multifoil insulation is made up of multi-layered reflective films. These layers, which are separated by wadding and foam form a thin insulating blanket. 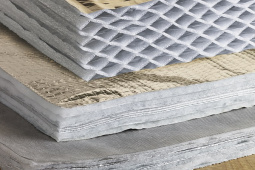 ACTIS breather membranes can be installed on the cold side of building in roofs and walls to protect insulation from air and water infiltration and enable water vapour to be evacuated. ACTIS Vapour Control Layers are additional products installed on the internal side of existing insulation structure to stop water vapour diffusion and improve airtightness of the building.